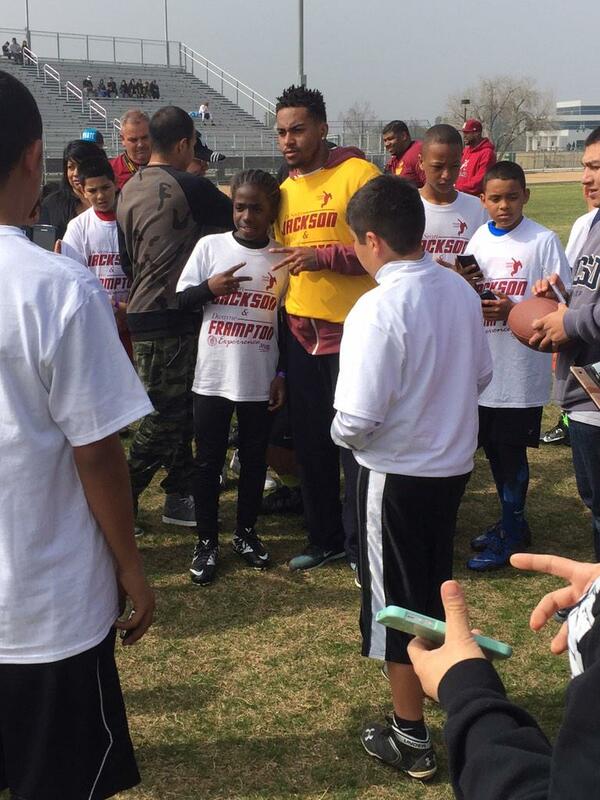 DeSean Jackson, Washington Redskins’ wide receiver; and, his mother, Gayle Jackson arrived at the 2015 Framp Camp, in Bakersfield, CA, today and was greeted by approximately 150 youth, parents, media and a corps of loyal Washington Redskins’ west coast fans. De’Anthony Thomas, “The Black Momba”, Kansas City Chiefs’ Rookie of the Year volunteered to help DeSean Jackson with his camp. Please follow De’Anthony at http://www.datblackmomba.com. 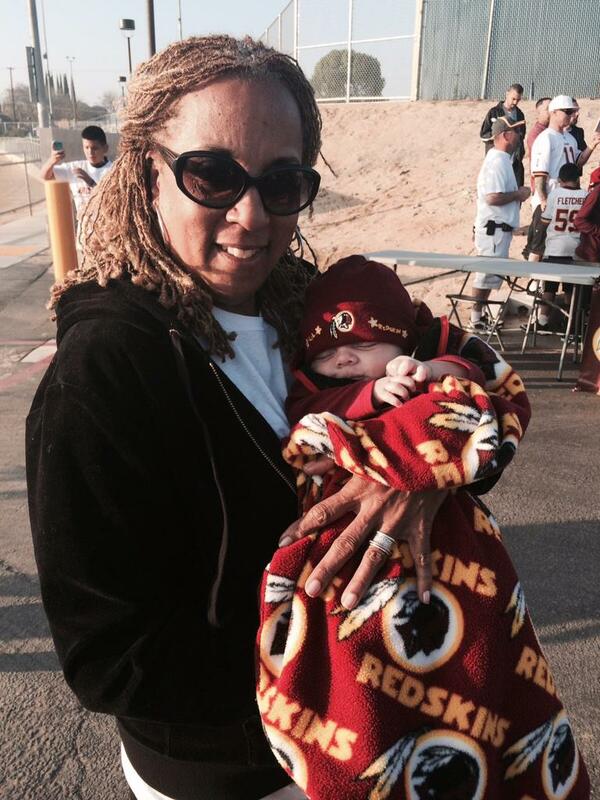 Gayle Jackson, President, The DeSean Jackson Foundation, embraces the youngest member of the Washington Redskins’ Nation at the DeSean Jackson –Framp Camp. DeSean Jackson, CEO, of The DeSean Jackson Foundation and Washington Redskins’ wide receiver spent two days motivating, encouraging and empowering the campers. Thanks to Dwayne Frampton for the Awesome work he is doing in the lives of our youth. Special Guests: DeSean Jackson, Washington Redskins, Isiah Green, Pittsburgh Steelers, Ryan Broyles, Detroit Lions, De’Anthony Thomas, Kansas City Chiefs. Framp Camp ” Here today to change tomorrow” was created to positively influence a critical youth demographic ages five and up . We provide athletes with a host of complementary lifestyle practices designed to prepare them to better deal with the challenges of everyday life. Targeting football and pairing young people with professional athletes and mentors, the program focuses on developing skills such as teamwork , education and nutritional balance in an effort to create a positive and / or healthy balance for a demographic susceptible to other less temptations. 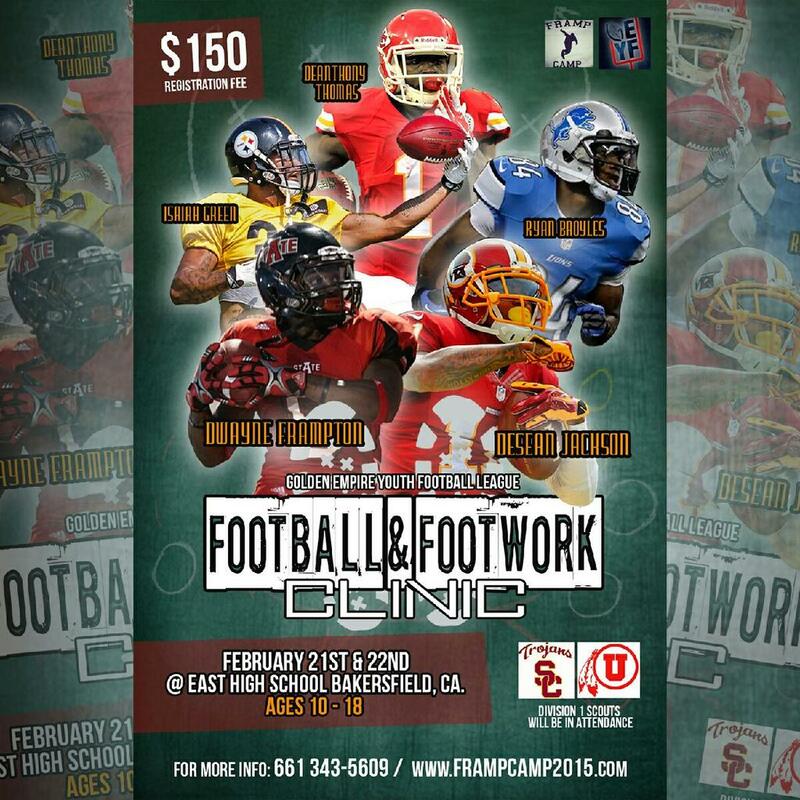 Framp Camp was founded by Dwayne Frampton , a former Division One Collegiate Athlete. coach Frampton has trained some of the Top Athletes in the N.F.L today such asDesean Jackson, of the Washington Redskins , Kelcie McCrayof the Tampa Bay Buccaneers, Demario Davis of the New York Jets, Adrian Robinson of the New York Giants and others . Frampton decided to embark on a long journey to train and mentor athletes due to his love for Football and the determination that he has to elevate young athletes today . He figured there was no better way to install the values of educational excellence , teamwork and health than to use his strong knowledge of football to deliver his message .